Gardening for self-sufficiency is different than gardening for fun. When we lived back in the suburbs, we had a small 10×15 or so garden plot, and each year we’d sit down and talk about what “fun” types of things we’d attempt to grow for the year. Preservation had that same “fun” theme, as we’d can pickles for the purpose of always having one of our favorite foods around, and we tried freezing green beans simply because we wanted to learn the process. 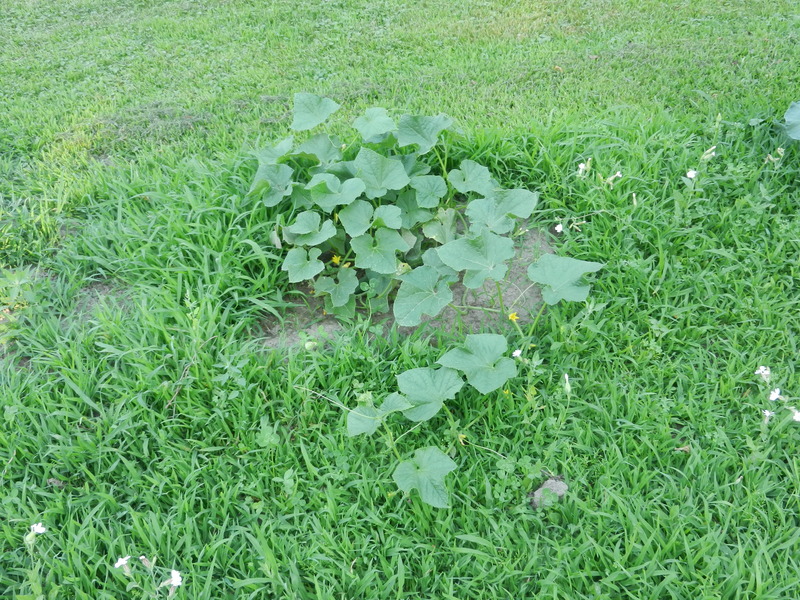 However, one of our goals in ditching suburbia for the sake of country living was that we wanted to begin to really turn our garden into a serious source of food for our family of six. What started out as a fun hobby is slowly becoming a vital source of food for the entire year. As such, the gardening we do now is vastly different than the gardening we did back in the suburbs. Don’t misunderstand: you can still have a highly beneficial, self-sufficient garden in urban areas, but the mindset for self-sufficiency gardening is vastly different than the mindset of gardening for fun. Today we’ll share some tips on how to garden for the purpose of producing a year-long or more bounty of food for yourself and/or your family. These are our “go-to” veggies and we plant LOTS of each of them. If you’re gardening for the purpose of self-sufficiency, it’s okay to try one or two “fun” or new veggies or fruits but it’s important to put your main focus on what you eat most and what you spend the most money on at the store. The goal is to plant enough of your main veggies that you can freeze or can a bounty that will last for 9-12 months until the next harvest. This will be our goal this year. Although last year was a garden fail, we’ve generally planted enough in past years to last six months or so. This year, we’re planning to “up” the quantity to last 9-12 months. Gardening on a large scale is HARD work. I remember during our first year of homesteading, after a long day of tending to the garden, laying down in the cool green grass, looking up at the beautiful blue sky, and bawling like a friggin’ baby. Gardening definitely has a calming quality to it, and some mornings after a crazy busy week here with homeschooling, freelancing, etc, I head out to the garden for the peace of sitting in the dirt and pulling out weeds. It’s like a gentle cleansing both of the garden and of the soul that leaves you feeling re-energized to face the busy days ahead. Other days however, tending to our large garden feels like an insurmountable chore and a general P-I-T-A. For the first three years of our gardening efforts, we went sans weed-killers of any kind. That, however, leaves a workload of weeds that we just can’t keep up with, so this year we’ll be applying a vegetation killer about a month before we plant. This will help avoid this type of scenario, which seems to be common in every large garden we’ve had. One thing about gardening: you need to learn how to do it well. We’ve had several epic garden fails over the last three years on the farm. My biggest disappointment is that we can’t seem to properly grow broccoli; one of our favorite foods to eat. So for this year, I’ll be doing a ton of research on how to successfully grow broccoli so that we can save the $7 a month we spend on the bulk frozen organic broccoli at Costco and create a skill that will last for generations to come. Preservation is HUGE when it comes to gardening for self-sufficiency. You can grow all you want, but if you don’t learn how to properly preserve it, you’ll be throwing most of your hard-earned harvest in the garbage or feeding it to the pigs. Here are some tips on preserving your garden bounty so that it’ll last all year long.Some things, such as potatoes and onions, can sit in a root cellar for months on end with very little prep needed. Other types of veggies need to be preserved – and quickly. I used to be terrified of canning, what with botulism scares and all. Thanks to this must-have gardening gem, Ball Complete Book of Home Preserving I’ve learned that canning isn’t nearly as difficult as it seems to the untrained eye. This book has definitely become my gardening Bible. It’s easy-to-follow and delicious recipes have done wonders in teaching us how to preserve well. We’ve become experts at canning dill pickles, spaghetti sauce, tomato sauce, jams and jellies, and our family’s favorite Smoky Chipotle Salsa. The one thing I haven’t yet ventured into is pressure-canning. Pressure canning usually involves canning meats, and since botulism is most prevalent among canned meats, I’m a little freaked out about this. I may go wild this year however and attempt canning some beef stew. We’ll have to see how brave I get. 🙂 There’s also the cost of a pressure canner, which is much higher than your basic hot-water bath canner. The price difference is substantial if you’re on a tight budget, but we may just spring for a pressure canner this year, as the long-term benefits far outweigh the immediate costs. Most of our food preservation – aside from pickles, salsas. 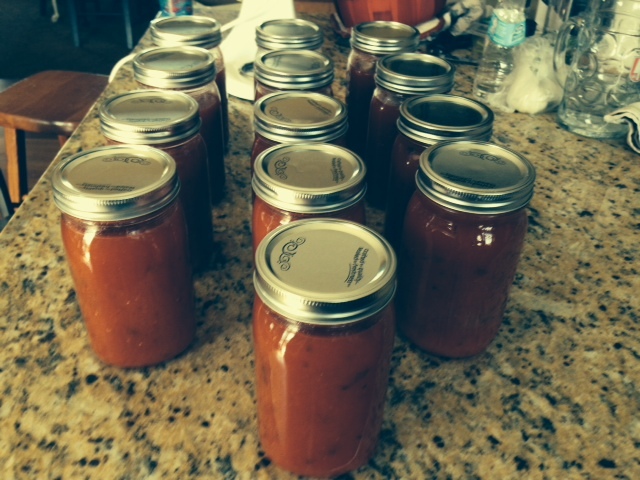 tomato/spaghetti sauces and jellies – comes via freezing. We grow green beans, peas, onions, green peppers, carrots, etc., and then chop and freeze them according to how we use them in meals. For instance, with carrots we use the frozen ones mostly in soups, casseroles and with roast beef dinner. So we chop some into large pieces so that we can cook them with roasts, and others into slices and dices for soups and casseroles. Two keys to freezing your bounty successfully are the chest freezer and the FoodSaver Vacuum System. Chest freezers are highly affordable, ranging in price from $150+ for a smaller one and upwards of $700 for a larger one. If I remember correctly, we paid roughly $300 for our 7.2 cubic foot chest freezer over a decade ago, and it’s been a powerful money-saving food preservation tool ever since. Not only does it hold our frozen garden veggies, the zero-temp freezer keeps the cow meat we buy from a local butcher (for less than $4 a pound) well-preserved for a year or longer. If you’re interested in long-term food preservation and huge grocery money savings, you have to invest in a zero-temp chest freezer. The other “must-have” for successful food preservation is a Food Saver Vacuum System. As shown below, a basic system runs around 80 bucks, and the starter pack, complete with a bounty of Food Saver bags, runs roughly at $130. This is another food preservation item that has paid for itself time and again at our house. By locking out air and sealing food tightly in thick bags, food lasts MUCH longer and doesn’t get freezer burnt. We have veggies in our freezer that are a year and a half old and still looking and tasting just fine, thanks to the Food Saver Vacuum System. This is one area we haven’t yet ventured into, but oldest daughter, after seeing a friend at work this winter with some delightfully delicious dried apples, which he eagerly shared with her, we’re committed to trying food preservation via dehydration this year. We’ll keep you updated on this project as we experiment with it. If you’re a regular reader, you know that I’m not at all comfortable with the financial state of America, and have been worried about it for some time, as so many of the economic signs we see mimic the years preceding the Great Depression. It was largely for this reason that we left the suburbs and moved to the country, that we may prepare in advance for any serious economic downturns by dumping our debt and learning how to be self-sufficient. Although things may be fine now in your economic world, learning how to garden on a level that sustains your family takes at least two years of practice – at a minimum – and you don’t want to be stuck in a situation where food prices are through the roof before you learn how to grow and preserve your own food. Instead, start practicing self-sustainable food growth and preservation now, so that if and when a devastating economic downturn occurs, you’ll be able to slash your grocery budget immensely by growing and preserving your own food. This is a life skill that each and every person should learn. Have you gardened before for the purpose of self-sufficiency? What are your top gardening tips? We’ve never gardened enough to feed ourselves all year, but we are slowly adding more vegetables, berries, and fruit trees, and along with that, learning to preserve more and more of the produce. My advice is to start by grow what you like to eat that is most expensive to purchase, or those things like tomatoes that just taste sooooo much better out of the garden. Slowly ramping up our gardening efforts has kept it feeling manageable. I think slowly ramping it up is the key. Otherwise it can feel overwhelming, leading one to give up altogether! I hear you on the better taste – yummy!! Funny, I get so excited when it comes to gardening this year. This is something I am hoping for in the future to grow my own food. With baby #4 arriving in June, my plans for what we are growing is going to change a bit. Last year I think I gardened for my tomato sauce and the fun part was that my extended family helped too. We canned a few jars and we were impressed. I’m thinking that our little garden is going to grow a bit this year. I didn’t know, Joyce!!!!!! Congrats!!!!!! Well then, growing your garden is a necessity with one more mouth to feed. Huge congrats! Where I live I wouldn’t have enough room for a garden for self-sufficiency, however, in my mind I say I want to be someone who gardens. We have small areas around the apartment where I can grow something (I’ve grow tomatoes before), but I have to ask myself how serious I am about keeping it up. I’m still not sure. But I love the idea of it! Preservation is key as you mentioned…even in Michigan we had tons of year round canned veggies, pickles, sauces, tomatoes, you name it. Thanks, Laura!! I’ve found home-grown and preserved food to be such a blessing in so many ways. Can’t wait till we can really ramp it up this year! 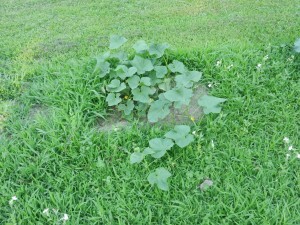 I admire you, growing a garden that will sustain you and your family over a year is really cool. Good luck with your fabulously fresh and delicious produce in the upcoming year – I look forward to any garden fresh salads you care to Instagram. Thanks, Lindsey! We are actually going to work on salad creations this year. We need to expand our whole foods recipes big time! I missed it. What is the actual 2016 plan? Hi Tom! I’ve strew throughout each section what our plans are for the year. If you read carefully, you’ll see them. 🙂 Thanks for stopping by, and thanks for the comment! This is one of my big goals for the year. Last year the garden got out of control! I could barely tell the weeds from the plants. It was pretty embarassing. This year I’m going to plan much better and be more proactive about weeding. I’d love to have a small garden at home. It does feel great to have one and it’s one way activity I and my kids can enjoy, Laurie. I’d include this in my goal this year 2016. My Mom has a big garden. She does some canning, mostly apple butter and pickled beets. They look somewhat the same when canned, so you got to pay attention, otherwise you might slather some pickled beets on toast. LOL! She freezes a ton of stuff because that’s the easiest for her too. I have such a terrible green thumb. I would attempt a tomato plant because I LOVE garden tomatoes. Unfortunately, the way my apartment is positioned, it doesn’t get much direct sunlight, so I don’t think it would work. I’ve been thinking about this topic a lot. I’ve had about an 8×8 garden for the past six years and it gives us a few tomatoes, cucumbers and beans. With groceries getting more expensive, it’s time to expand. The added benefit will also be reducing the amount of lawn space we have to maintain. Do you have any advice for how to calculate how much to plant and how much space you use? Yay! Glad to hear that, Chuck! GREAT question. I’ve never calculated myself, but I did find this link online: http://www.wellfedhomestead.com/how-much-should-you-plant-in-your-garden-to-provide-a-years-worth-of-food that I think would be helpful. We’ve planted 6 months’ worth of food before, but not twelve, and we did roughly 12 green bean plants, 12 pea plants, 36 onion plants, 15 carrot plants, and 8 tomato plants. We did 20 potato plants but those didn’t produce very much so we’ve got to work on that side of the equation as well as up the number of plants we plant. And, there are six of us in the family so that makes a difference too. My goal for this year is to be more meticulous about how much we plant and how long it lasts us. I will keep you updated. You do the same!! How many people are in your family? Thanks for the link Laurie. I’ll check it out. There are four of us, one of which is an exceptionally picky eater. She’s not keen on most veggies, but does seem to respond better if she’s involved in the growing and can eat it fresh out of the garden. We finally bought our house and 2016 will be the first year we have a garden of our own, I look forward to trying. You have the gears in my head turning about the state of the economy and you are right in the fact that we should all have gardening skills. Looks like I’ll be needing a vacuum sealer and lessons on how to can from my husband’s grandmother! Yay!! So glad for you that you have a canning mentor nearby!! It really is a fantastic skill to have. While I wouldn’t say that I’m gardening for self-sufficiency, I’m doing my best to minimize our summer produce costs. I’ve been at it for a few years now, and it’s slowly moved from pure hobby, to something a bit more utilitarian. For example, I know not to plant many green beans, since no one in our house is a big fan of them. However, everyone LOVES eating cherry and grape tomatoes right of the plants, so I grow tons of them. Please share lots of pictures and posts about your garden this year! !